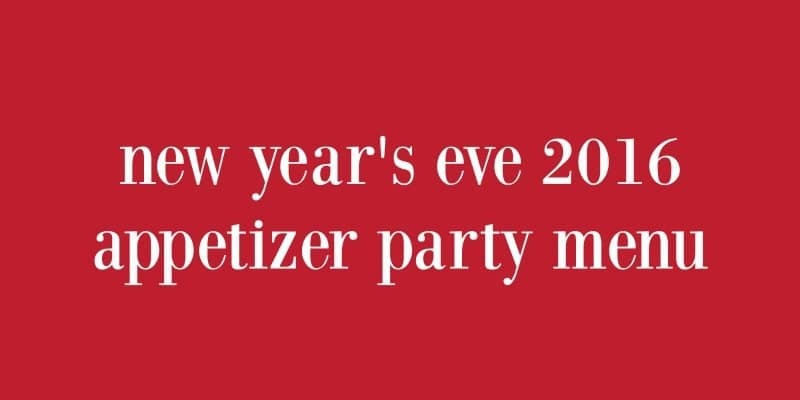 Want to throw a New Year’s Eve Party and dread planning the menu? 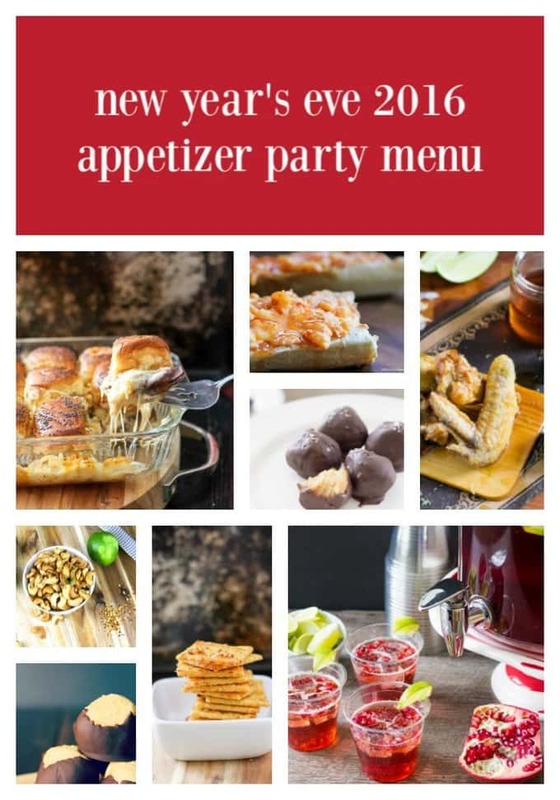 Check out my appetizer menu for a spectacular party complete with a large batch punch to toast at midnight! 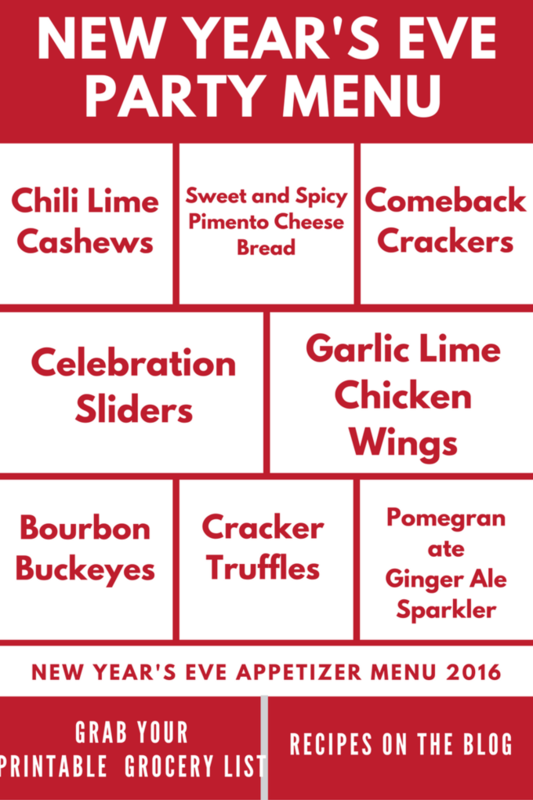 Want to throw a New Year’s Eve party this year but running short on time for an extensive menu? How about throwing an appetizer party instead of a sit-down dinner. Hearty appetizers and fun snacks will keep your guests happy and mingling around the party right up until midnight! I assembled the perfect menu of finger foods and light snacks that are easy to make and even more fun to eat! Let’s start with some nuts. Everyone has mixed nuts at a party because they are easy to pick up and toss a handful in your mouth without having to hold a plate. I mean, you need at least one hand free and the other one should be holding a cocktail! My Zesty Chili Lime Cashews are way better than those canned, mixed nuts you get at the store! A bright lime flavor along with a hint of spice make these cashews perfect for your party!! 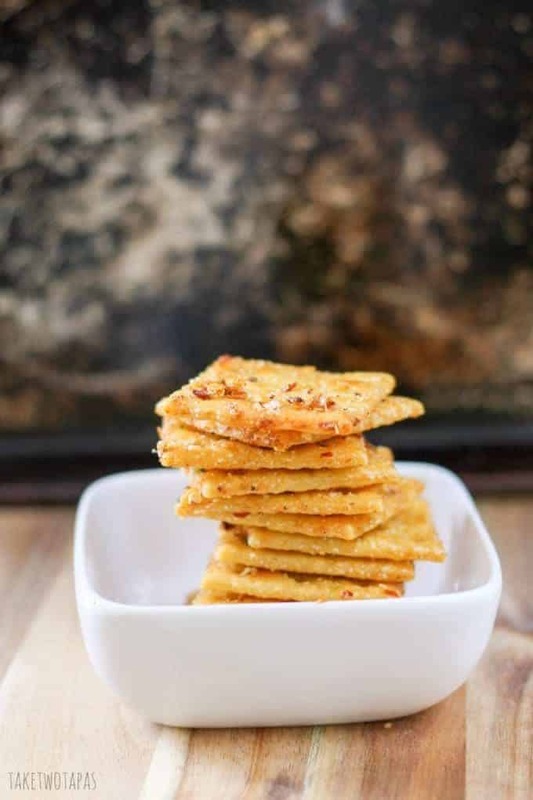 Another great one-bite treat to serve is my Comeback Crackers. These too have a kick to them but coupled with buttery crackers the spice is just right. I used my All-Purpose Steak Seasoning for my crackers but feel free to grab a small jar at the store when you go to get your supplies. I have added a printable shopping list at the bottom of the post that you can download and take with you to the store. The seasoning is listed as one item on the list but if you want to make my blend at home check out the recipe to make sure you don’t need to pick up any additional spices. Best thing about these crackers, besides that it makes an entire box, is that you can make them a few days ahead of time! I don’t know about you but when I am planning a menu I always add bread. Whether I am just serving it alongside a soup or pasta dish, or if I am making a crostini, I add it to the menu list. 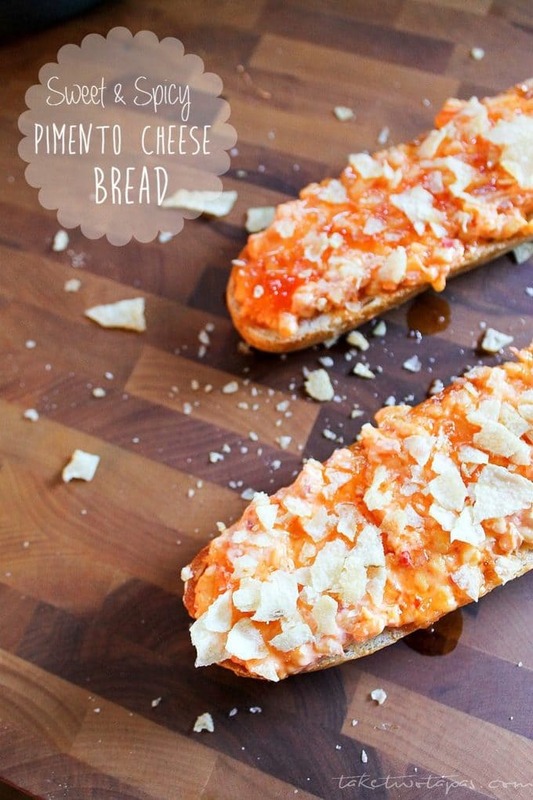 One of my favorite party bread recipes is my Sweet and Spicy Pimento Cheese Bread. I have a problem when it comes to eating at a party. I start eating something savory and in the next bite, I want something sweet. If I eat something soft, I want something crunchy. Do you have that problem too? This bread has it all. Chewy French bread, spread with creamy pimento cheese, drizzled with a sweet and spicy hot pepper jelly and topped with crunchy kettle chips. Crunchy, chewy, sweet, spicy, creamy. All there in one bite. Maybe two depending on how small you make your slices. I make mine about 1-2 inches across so I can get a few bites of all these textures and flavors but you can make them smaller if you need to. I used my homemade pimento cheese recipe but feel free to buy a small tub. The shopping list below only has pimento cheese listed so make the necessary adjustments for additional items if you need them. All the components of the pimento cheese bread can be made ahead of time and assembled right before serving. Bonus for party set up!! Another thing that I like to serve that is a tad more hearty are some sliders. You may get a few people who didn’t eat before they showed up to your house and need a little more in their stomach before they start on the cocktails. My Celebration Sliders will do just the trick! 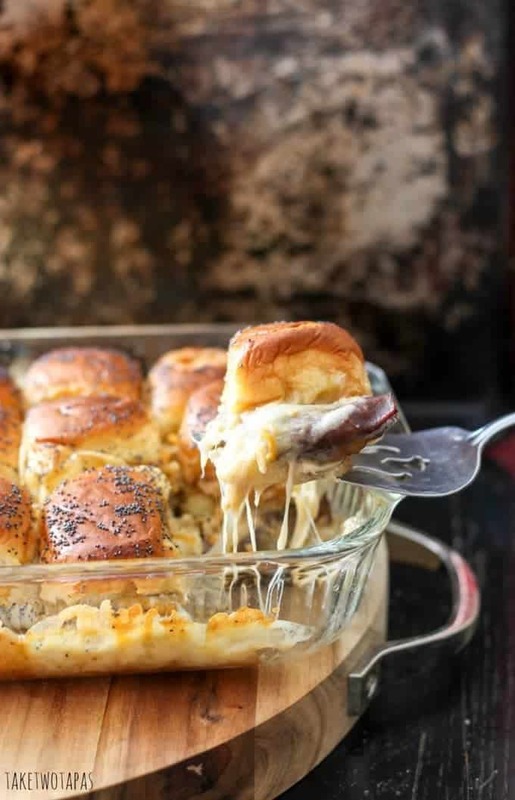 Thick potato rolls ( I used dinner rolls a few times too) spread with a tangy horseradish sauce, sliced roast beef and lots of gooey cheese make a great combo! Assemble the night before. Add the marinade. Store in the fridge for at least 4 hours or overnight and then cook when ready to eat! The marinade is tasty all by itself but even better on sliders! Chicken wings may not seem like a glamorous food to serve at a party but men like to eat chicken wings anytime so why not on New Year’s Eve? My hubby can eat them one-handed so they are the perfect party food as he can have his drink in one hand and his wing in the other. 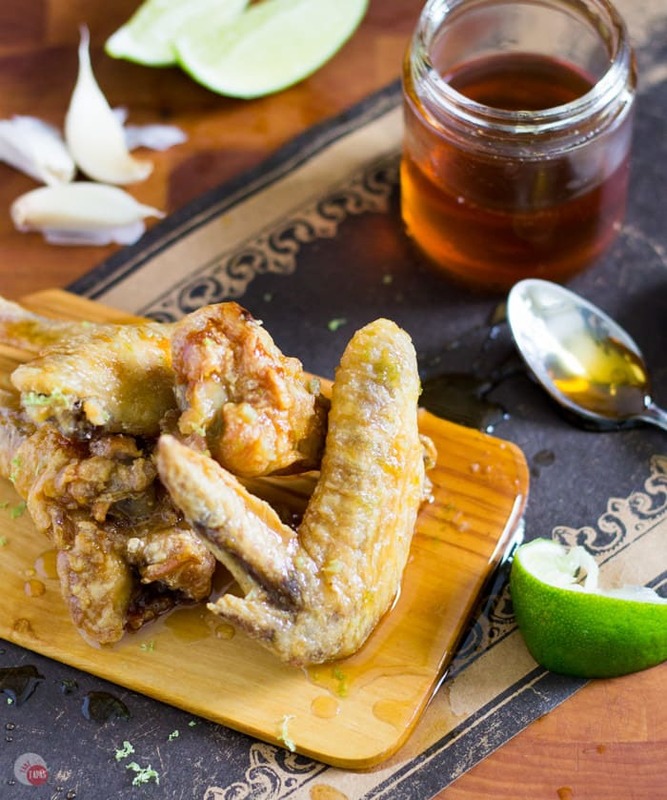 My Garlic Lime Wings are a nice addition to your party with their sweet and zesty sauce. These are baked and can be made a few hours ahead of the party and just kept warm until ready to serve. Now that you have all the savory offerings handled, let’s switch over to the sweet side of things. Since it’s a party, let’s start with some boozy style sweets. My Bourbon Buckeyes have the chocolate peanut butter flavor combination that everyone loves with some bourbon for partying past happy hour! 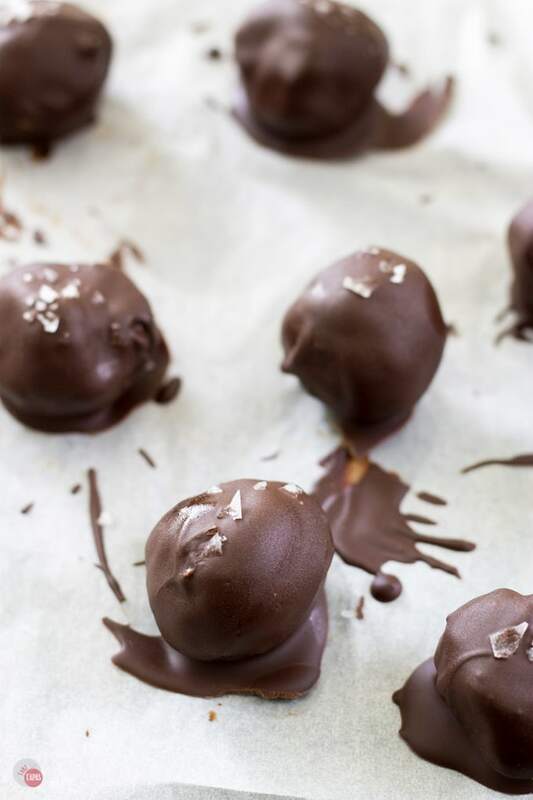 For a sweet treat with a hint of salt, my Cracker truffles are a perfect choice. 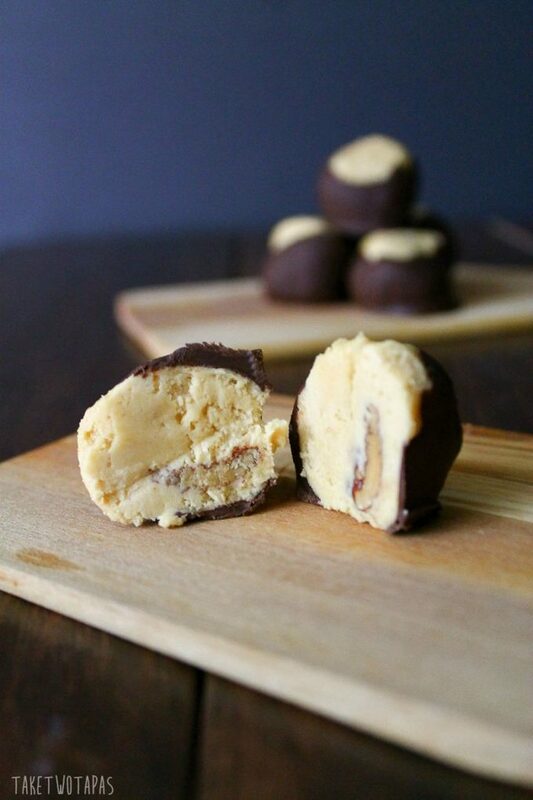 Peanut butter and honey crackers that you usually put in your lunchbox are rolled into tiny bite-sized balls and dipped in dark chocolate. They are great for popping in your mouth while you are talking New Year’s Resolutions and all the things you are going to accomplish in 2017. No New Year’s Eve party would be complete without a cocktail. I have a large-batch one that is crispy and bright and will keep you from being behind the bar all night long. 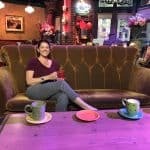 It even has a “mocktail” version for those that are the designated drivers and are ensuring the party-goers get home safely. My Pomegranate Ginger Ale Sparkler is a delicious way to ring in the new year with friends and family. I have had a great time cooking recipes for you this year and look forward to 2017! Below I have a printable shopping list to make your menu planning even easier! Enter your email address and it will be delivered straight to your inbox. Grab your shopping list here!